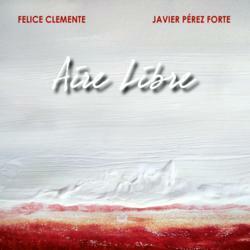 "Aire Libre", the latest release from critically acclaimed Italian saxophonist Felice Clemente and noted Argentine classical guitarist, composer and arranger Javier Pérez Forte will be available digitally March 13th on Crocevia di Suoni Records. Utilizing elements of Jazz, Afro, South American and Classical music, this 10-song release is a stunning, instrumental collaboration between two celebrated artists. "Aire Libre" is the result of Clemente and Pérez Forte’s open and free conception of music that overcomes limits, stereotypes and barriers. Inspired by a cultural diversity, the album’s variety of rhythms, and diverse instrumentation take the listener on a remarkable, global sonic journey. Throughout the "Aire Libre", Clemente’s superb mastery of the soprano saxophone, tenor saxophone and clarinet establish intricate dialogues with the Pérez Forte’s inspired classic guitar that communicate powerful emotion without words. “Each of the ten tracks on this CD invites us to live a different state of mind -- not only because of the variety of rhythm but also because of the several colors of sounds suggested by the different instruments,” says Clemente. On the track “A Don Agustin Bardi” -- Clemente and Pérez Forte’s musical prowess creates a subtle, jazz-tinged “conversation” between sultry guitar chords and bright, spirited tenor sax that brings to mind a wise elder speaking with a young, spirited soul. The fluttering, gentle strains of tenor sax on “Chuku” soar like a butterfly lifting up the listener with their lilting progression. While the complex exchange between guitar and saxophone on “Lila,” is punctuated by the steady pulse of a metronome. “The several compositions presented in this work do not correspond to pure musical genres. We take Jorge Luis Borges’ words and make them our own when we say, “Happily, we don’t belong to only one tradition. We can aspire to all of them,’” says Pérez Forte. Clemente’s previous release, Nuvole di Carta, received four stars from Downbeat Magazine, stating, “Nuvole di Carta is an excellent record that demonstrates that Clemente and his peers deserve wider recognition in the United States."